First job today was to solder the 470Ohm tuning and the 510Ohm manual gearbox resistors inside the 40 way Efi connector, to the appropriate terminals. I was hoping to finish grafting the Efi loom into the Lightening Looms item, but even though they said the parts would be with me by Saturday, Lightening Looms did not live up to their name (not the first time either). So I set about wiring the main loom into the Sierra column stalks. Bit of luck here, the ripault connector terminals supplied previously for this task by Lightening Looms, are a perfect match for the terminals inside the Ford connectors. So it was just a simple case, I thought, of pulling out the old, crimping on the new and pushing them back in. Hmmmm, problem was the Haynes manual I have is for V6 Sierras and not the basic model that my stalks came from. That being said the diagrams that I did have were not a lost cause since the switch gear is the same even if the wiring colours were not. That coupled with the Lightening Looms drawings saw me complete the task by close of play today. Strangely, I found a page in the Lightening Loom instructions telling me what colour wires were supposed to connect onto which terminal of the stalks. Although it was 80% the same as I had installed the connectors, some of the colours mentioned in the instructions bore little resemblance to the actual wires that were in the loom (notably the brown wires mentioned were actually violet in the loom). I was pleased that I found this rather inaccurate page only after I'd finished. Additionally I had several wires left over from the Hazard/Indicator/Flasher side of life. This, I think, is due to the loom being made to support individual indicator and hazard switches in lieu of the Sierra stalks. Anyway checked it all out with the multimeter and identified both ends of all the unused wires. IRTBS if I'm right about the above wiring. The above might well have been made considerably easier if Ford had adopted a more logical numbering system for its stalk terminals. Where on earth did they get 54, 56a, 56b, a31s, s40, 15 etc. etc.!!! In terms of wiring all that's left is completing the Efi grafting and connecting up the instruments in the dash. As far as the exhaust system is concerned, my man at work was unable to help so I'm still trying to decide whether to have a bash myself, with my brother-in-law's help, or take the collectors to a light engineering company for welding. Firstly I have to say only the truly dedicated or the truly mad would have decided to work in an unheated wooden shed this weekend. Still, woolly hat to the fore, I soon forgot the numbness in the fingers! 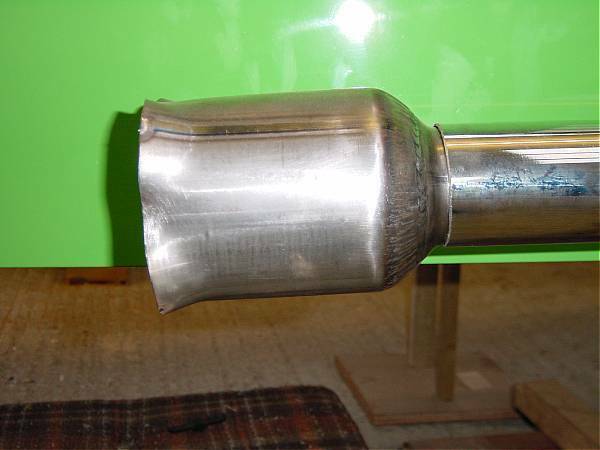 Through a friend of my fathers, I've managed to get the exhaust collectors welded up. The guy did a first rate job and they look like the welds were done with a brush! So armed with the collectors, last Sunday I set about cutting and fitting the various bends to form the manifold branches. I had given much thought as to how I would do this but, although on the face of it fitting them should be simple, it turned out to be rather complex to get the bends to fit near to the collector whilst ensuring the other bend would mate flushly with the manifold flanges. Still, after a day of cutting and fiddling one side was ready for welding. Unfortunately due to the kit comprising predominately 90 degree bends, I ran out of 75 & 45 degree bends to complete the other side. I ordered some more from Custom Chrome but, guess what, they sent 1.75" tube instead of 1.5" tube. Oh well its not really a problem to send them back and wait for the correct items since my friendly welder can't complete the job until after the new year. The switched live (ignition) connection. Road speed sensor connection (TBA). ECU warning lamp connection (TBA). Once the above were spliced in, I decided that there was really no reason not to fully try out the ignition/Efi system. So I connected the battery, put the key in the ignition switch and turned it to ignition on. Nothing, not even the fuel pump running. I have to say that I was a little downbeat at this point. Still I decided to push on and turned the engine over anyway (there were no spark plugs or any petrol in the car). At least that still worked. I decided to see if there was any power getting to the fuel pump, so out came the multimeter. Nada, zip and S.F.A. power to the pump. I was beginning to think that I'd wired up the Efi unit wrongly or worse blown it up internally. However I carried on and checked that all the connections were tight and listened to the relays to see if I could hear them being activated. The ignition operated relay was working but the one which operated the pump (controlled by the ECU itself) was not. At this point I realised that I had not fitted the hot-wire air flow sensor (oops). Plugged it in and still the fuel pump she no run. I was just beginning to wonder if I'd overridden the automatic gearbox ignition switch connection correctly when everything sprang to life. The pump ran when the ignition was switched on and the bypass air-valve (stepper motor) unit made an odd 'buzz' when the ignition was switched off. Other than plugging in the airflow sensor, I had changed nothing. The only conclusion that I could come to is that the ECU needed time to 'get its act together' and 'initialise' itself having been without power for at least the last 14 months. If you have any other ideas or theories please e-mail me (perhaps the highly regarded and eminent R.R. guru, Mr. D. Graham, would care to comment). After that, every time I tried the ignition system, the ECU activated the fuel pump relay which then ran. I am heartened by this event since it seems to suggest that the ECU is happy to let the engine run without many of the ancillaries that I have removed or never had. Since I have disconnected the battery (just in case) until the next time I work on the car, I will see if the above Ecu delay manifests itself when it is again re-powered. Just for good measure, I connected a spark plug to the distributor to see if I got a spark (even though this has absolutely nothing to do with the Efi system). And yes, a good healthy spark was seen. Fuel tank breather need to be sorted. Heater connections need to be looped. Exhaust needs to be fitted. So as you can see it's only the exhaust that's delaying THE day! Until I can get the exhaust welded up, I'm turning my attention to fitting the dash and instruments, the front suspension and trying to decide on wheels. Curiosity got the better of me so I drove over to my father's today to see whether the Efi system worked straight away or was delayed. So I reconnected the battery and tried the ignition again. Well, the darn thing worked straight away. I guess that either the ECU got enough charge yesterday to restore any lithium battery that might be inside or I have a dodgy connection somewhere (I so hope not). Just to convince myself all is dandy in the Efi garden, I took the connector off of an injector and whilst turning the engine over measured to see if there were any 'firing' volts. There were and they appeared to be in time with the rotation of the engine. It always seems that with the passing of one stumbling block, several more then come along. I'm now beginning to wonder about exactly how well the engine and Efi combo will run AND what the emissions will actually be like. Not forgetting the higher than usual compression ratio (10.5:1 IIRC), what fuel should I use? I suspect I will run it firstly with 4* LRP and octane enhancer. Later (when I'm using much more fuel) I will go over to UL with octane enhancer. What should the static ignition advance be? Oh now I've got a headache. Having sought advice from 'the list' as to static ignition timing, the consensus seemed to be 6° BTDC. So I began to set this up. 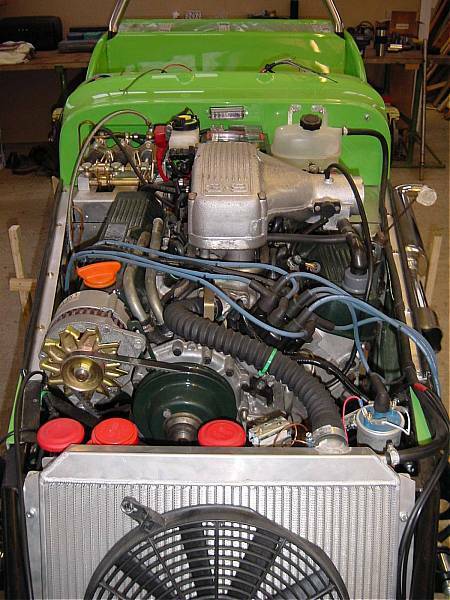 The first problem here was the lack of space to access the crank pulley bolt, to turn the engine over. This was due to the airhorn installation and the top water hose. Eventually a 1/2" drive ratchet with a 'UJ' stylee extension was the only way to get any torque on to the crank pulley bolt. Thankfully the RR pulley assembly comes with a very nice 'damper' marked ±12° of TDC in 3° steps making lining up the timing 'pointer' to the correct mark nice 'n easy. BTW, the damper mentioned is a small flywheel that is supposed to prevent the crankshaft twisting along its axis when the various cylinders fire. I'm not sure what influence changing the 'proper' flywheel to a lighter than standard item will have on the damper's effectiveness. So I having finally got the mechanical timing set-up correctly I then checked to see where the rotor was pointing inside the distributor. Hmmm, it was exactly between two of the HT lead contacts. At this point a potentially HUGE problem arose. I could not twist the distributor any more than ±3° or so, which was certainly less than was needed to get the rotor to meet up with either of the nearest HT contacts. The reason for the limitation was that; twist it one way and the vacuum unit it hit the water pump housing, twist it the other and it hit the modified thermostat housing. I then realised that the original RR thermostat housing was very narrow and the top radiator outlet went up and away from the water pump housing, unlike my Dax modified P6 item. It then became obvious why the RR thermostat housing was so narrow.....to allow room for the vacuum advance unit when timing the engine. Fortunately the solution was (hopefully) relatively simple. I removed the distributor and reinstalled it rotated approximately 150°. In this configuration the vacuum unit is free to move in the space between the water pump and the NS head. The only restriction to rotation is the small electronics pack on the side of the dizzy. Being smaller than vacuum unit meant that it by positioning it between the water pump and thermostat housings, a greater range of timing adjustment could be achieved. This solution allowed me to line-up the rotor with an HT contact with some (small) room for adjustment when the engine's running and the timing light is used. It was then just a simple matter of fitting the HT leads to the appropriate terminals. Trev's Tip:- Make sure that when modifying the Rover thermostat housing, you allow enough room for the distributor to rotate. Otherwise setting up static ignition timing might prove problematic. After the trauma of the above I returned to the exhaust pipe saga. 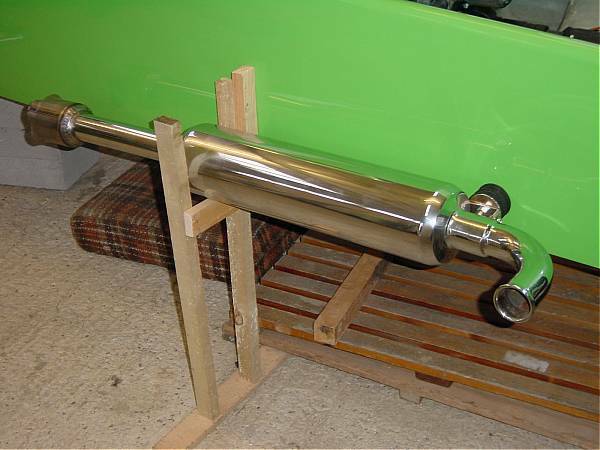 I had already fitted one of the silencers and cut the tube for the manifold branches. 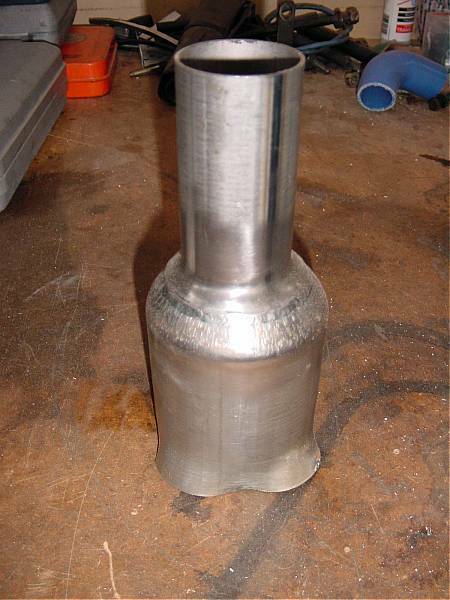 I lieu of a welder (both kit and operator), I decided to fit the other silencer. 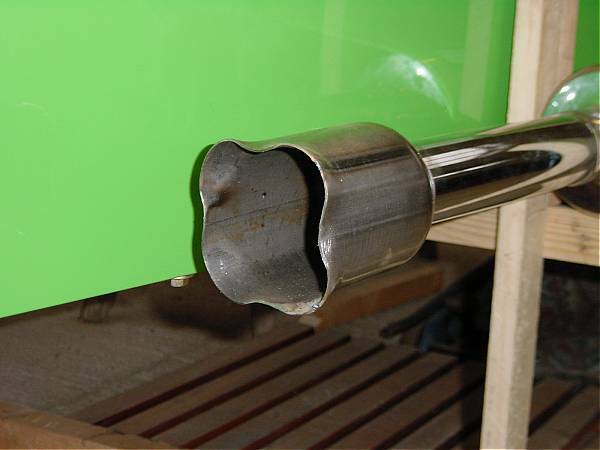 Unlike the Dax item, the Custom Chrome silencers fit to the side panel of the car and so I had to repeat the process of strengthening the side panel as described in November's page. At this point it was time to call it a day since my father needed my help assisting him in re-plumbing a shower in his bathroom!! Small price to pay for long-term rent of his workshop. Still, standing looking from the front of the car at both the silencers in position, the CC Megazones look very businesslike and perhaps you could even say aggressive.